Antelope Horns are a member of the Milkweed Family. It grows to 12 inches in height and has dark green, narrow leaves with a grayish mid-vein which grow to 6 inches in length in a cluster at the base of the plant. It grows on dry plains, slopes and clearings in oak woodlands and pine forests at elevations between 3000 - 9000 feet. Antelope Horns are also known as Spider Antelope Horns. 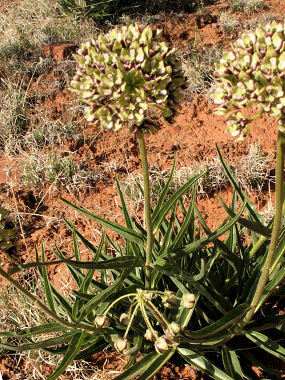 Antelope Horns blooms between April - August and produces greenish yellow flowers tinged with maroon with five petals to 0.5 inches in width, that grow in a spherical cluster at the ends of the stems. Flowers are followed by a green pod to 6 inches in length.